^ 1.0 1.1 Greta Thunberg, 16, up for Peace Prize. 2019-03-14 [2019-03-17] （英国英语）. ^ 2.0 2.1 Swedish teen climate activist Greta Thunberg nominated for Nobel Peace Prize - The Globe and Mail. www.theglobeandmail.com. [2019-03-18]. ^ Over 1 million students across the world join Global Climate Strike. [2019-03-16]. 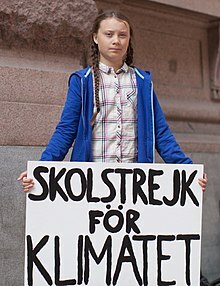 ^ 5.0 5.1 School Strike for Climate: Meet 15-Year-Old Activist Greta Thunberg, Who Inspired a Global Movement. Democracy Now!. [2019-03-17] （英语）. ^ hermesauto. Climate crusading schoolgirl Greta Thunberg pleads next generation's case. The Straits Times. 2018-12-05 [2019-03-17] （英语）. ^ 【為了氣候變遷，我罷課】從獨自一人到各國響應 16歲瑞典女孩喚醒全球環保意識 -- 上報 / 國際. www.upmedia.mg. [2019-03-17]. ^ You Are Stealing Our Future: Greta Thunberg, 15, Condemns the World’s Inaction on Climate Change. Democracy Now!. [2019-03-18] （英语）. ^ Hertsgaard, Mark. The Climate Kids Are Coming. 2019-01-28. ISSN 0027-8378 （美国英语）. ^ Thunberg, Greta. 'Our house is on fire': Greta Thunberg, 16, urges leaders to act on climate. The Guardian. 2019-01-25 [2019-03-18]. ISSN 0261-3077 （英国英语）. ^ Climate activist Thunberg urges EU to double carbon reduction targets. news.yahoo.com. [2019-03-18] （美国英语）. ^ Swedish teen leads Belgian students on 7th climate march | Miami Herald. web.archive.org. 2019-02-22 [2019-03-18]. ^ Greta Thunberg: ”Vi vet – och vi kan göra något nu”. Svenska Dagbladet. 2018-05-30 [2019-03-17]. ISSN 1101-2412 （瑞典语）. ^ TIME's 25 Most Influential Teens of 2018. Time. [2019-03-17] （英语）.